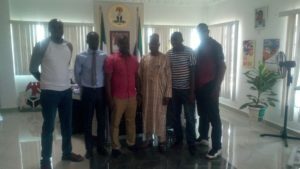 Five Nigerian medical doctors bade farewell last Thursday, 17th January, 2019, as their two-year service in Sierra Leone has ended. The doctors include Dr. Fadumiyo Adeola, Dr. Iminabo Harrison, Dr. Fasomoyin Oluwaseyi, Dr. Atilola Adeleke and Dr. Giwa Temidayoo. The doctors arrived in Sierra Leone on the 19th January, 2017, to help the government and the people of Sierra Leone. Dr. Fasomoyin Oluwaseyi, one of the volunteers, said being in Sierra Leone on such assignment was an exciting moment for him. He said he was always opened to come back to Sierra Leone as long as the bi-lateral relationship between the two-sister countries continues in good faith. The medico said when he returned to Nigeria, he would have to report to the Minister of Health and present his certificate, thus noting that it was difficult for him to leave his area of deployment as he had got used to the community. He registered the federal government’s commitment to continue supporting Sierra Leone with any assistance it would need in the future. Dr. Iminabo Harrison, who worked at the UBC Mattru-Jong government hospital, Bonth district, said during his stay at the hospital, he faced several challenges including, electricity, transportation and other environmental issues but that he was able to overcome the challenges. He said there were 88 beds at the hospital which admitted over 750 sick people with different diseases. The physician specialist, Dr. Atilola Adeleke, who was attached to the Kailahun government hospital, and later Connaught, said his duty was to decorate, prevent and rehabilitate the hospital. He mentioned that when he was transferred to the Connaught hospital, he taught medical students that were on internship. Dr. Adeola Fadumiyo and Dr. Giwa Temidayon expressed similar sentiments.